Grocery stores and supermarkets are some of the most complex types of businesses. You’re often dealing with a variety of different types of employees and businesses all in one, from bakeries to delis to retail and beyond. So, you probably need a variety of commercial mats to handle all of these needs. 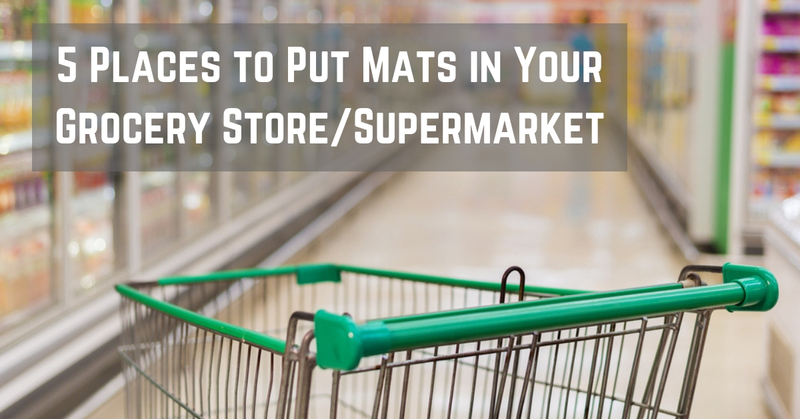 Here are some places in your grocery store or supermarket that might benefit from commercial mats. 1. At all of your entrances and exits. Cleanliness is important for any business, so placing mats at the entrances and exits of your grocery store or supermarket is a no-brainer. You’ll want to provide scraper mats to remove dirt and debris from the bottoms of shoes before it reaches your floors, as well as carpeted entrance mats to absorb moisture and reduce slipping and falling hazards. With all of the foot traffic that you get on a daily basis, mats for your entrances and exits are a necessary investment. These locations are also a great place to promote your brand through logo mats! Did you know that standing for long periods of time can cause pain and fatigue? Your cashiers likely suffer from some kind of pain caused by prolonged standing. That’s where floor mats come in. Anti-fatigue mats are a specialized type of cushioned matting that actually reduces stress on the lower parts of the body, resulting in happier and healthier employees. In addition to your registers, there may be other locations in your grocery store or supermarket where employees are required to stand for long periods of time, such as behind any bakery, deli or seafood counter. You should consider placing anti-fatigue mats in these areas to reduce fatigue and promote better customer service. 4. Areas that are prone to moisture. There are areas of your grocery store or supermarket that are more prone to wet floors and would probably benefit from some kind of absorbent mat to reduce moisture and prevent slip-and-fall accidents. These areas could include your freezer sections, refrigerated displays, produce and drinks sections. 5. Other places you identify. No one knows your business better than you do. So, conduct a walk-around to identify areas of your supermarket or grocery store that would benefit from custom floor mats. Look for places where your employees are spending a lot of time standing, areas that get frequently wet or dirty, areas that pose potential slip or fall hazards, or areas that could use some brightening up with a custom logo mat. No matter what kind of mat you require, or what kind of business you run, NDC has a mat option for you. Contact us today to learn more about our commercial mats and maintenance services! We can help you with a custom floor mat solution that makes your business safer, cleaner and happier overall.